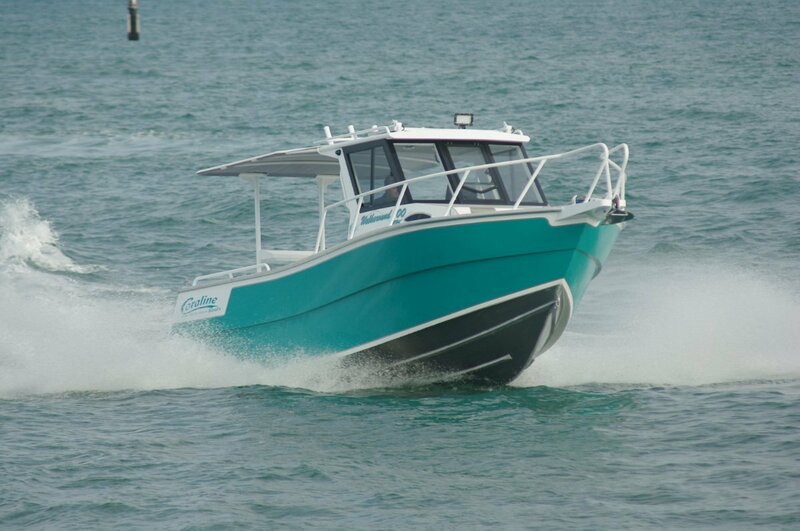 The walk around Coraline 700FX is probably the definitive fisherman’s version of this much built hull. It gives all the rail access of an open boat but a lot more of civilization’s comforts. Its beam allows decent foot traffic space around the cabin, plus wide enough protected driving space to spread the seats for easy access between them to the cabin. That protected space can be as open or closed as the weather recommends. The sides extend aft of the seat backs, as does the hardtop. Not only is there sliding side glass for the better days, but the windscreen’s centre panel also opens. The better days are likely to predominate as the owner intends basing the boat in Exmouth for much of the year. That location calls out for shade, which Coraline has provided in spades. The entire deck aft of the hardtop has the permanent protection of a fabric awning carried on a pipe frame. It is just possible to sleep in the cabin, although much more comfortable on air mattresses on the after deck, but its main purposes are storage and containing the toilet. This is an electric flushing model – way ahead of the chemical alternative in convenience. It is matched with a lockable door – also useful for the storage role – and side windows. The driving position is typical Coraline: backsides and feet properly catered for, visibility excellent, sightlines for displays and monitors just right. The seats are slide mounted on roomy locker boxes. Radios and the entertainment system are mounted in overhead consoles within the lined hardtop. As usual with Coralines an upholstered settee stretches across the transom. 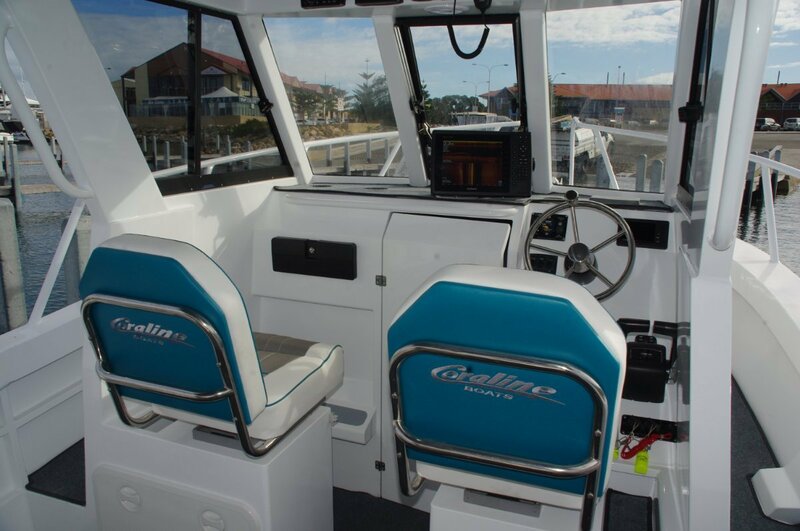 Capable of seating three strangers or four good friends it is foldable or removable to increase fishing room. The current generation of outboards is extraordinarily reliable - provided the fuel and electricity supplies are kept up to them – but with remote expeditions on the cards the owner opted for twin motor safety. The twin 115hp Yamaha four-stokes deliver a combined thrust a little below that typically chosen for this hull, but it is certainly more than adequate. Single motor performance, too, is on the money providing easy planing. Also with distant water travel in mind, fuel capacity has been upped from 300 to 460 litres split between two tanks. Electrical demand is a little above the ordinary and, in a belt plus braces approach, the owner specified not only a dual battery system but also a solar panel mounted on the hardtop. Before you write off power windlasses as decadent live with one for a few trips. They will then seem indispensible. The review boat has a beauty: a stress-free, free fall drum model. This is about as fool proof as they come. Driving the whole operation from an armchair is as good as decadence gets. Fishing is a large part of this boat’s purpose in life, and it has all the important accessories. Half a dozen rod sockets across the hardtop, more in the coamings; a large below deck catch tank-ballast chamber; a bait board in unit with the awning’s rear supports; a powered deck wash. Depending on how messy a fisherman you are the transom shower with its 50 litre tank could count as a fishing accessory. A head of the windscreen the carpeted deck takes a step up to a privileged fishing position. Unusually the bow rails take a similar lift to maintain safety. Rails in general are a strong feature on board: along the edge of the hardtop, along most of the cockpit coamings and along the trailing edges of the hardtop supports. Aluminium boats are generally lighter than the same size of fibreglass, but when the hull is made of 6mm plate the difference is not so great. Trailing weight is kept down by an aluminium trailer, custom built by Coraline. For minimum labour at the ramp Coraline also fitted a remote catch and release.